Be inspired by this Spanish favourite! 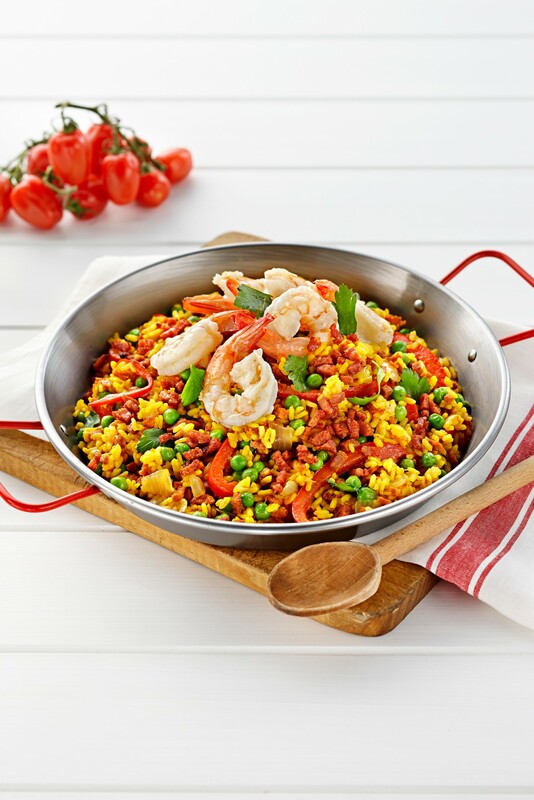 Escape to the flavours of Spain with this delicious chorizo and prawn paella. Heat fish or chicken stock in a medium saucepan until boiling, add saffron threads and set aside. Pan-fry green prawns in olive oil until just turning pink. Remove from pan and set aside. Add red onion to pan and cook for 1-2 minutes until onion is tender. Stir in rice and Don Chorizo, cook on a medium heat for 1-2 minutes until rice has changed colour. Add heated stock and bring to the boil stirring continually. Reduce heat and cover and simmer for 15-20 minutes, stirring occasionally. Stir in frozen peas and red capsicum and cook uncovered for a further 5 minutes. Top with cooked prawns, cover and allow to stand for 5 minutes. Serve garnished with parsley leaves. ® Registered trademark of George Weston Foods Limited. All rights reserved. Site by Online Circle Digital.